A slow-motion cosmic "car crash" of immense proportions has come into sharp focus for astronomers. The Pandora cluster - so named because it comprises so many unusual phenomena - is a mess of four galaxy clusters that have collided over the course of 350 million years. The "crash investigation" should yield clues about the nature of dark matter. A report to be published in Monthly Notices of the Royal Astronomical Society outlines the unique find. Galaxy clusters are the largest structures we know of in the Universe, comprising hundreds of galaxies and trillions of stars - along with huge amounts of hot gas - and dark matter.. Very few galaxy cluster collisions have been caught in the act. 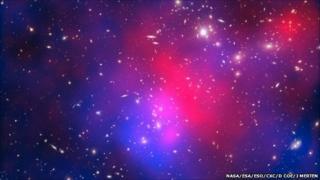 Most notably, the Bullet Cluster made its name as the site of a collision between two clusters in a crash that should in time help unravel some of dark matter's secrets. Richard Massey of the Royal Observatory Edinburgh said that to learn as much as is possible from these crash scenes, the collisions have to be captured at just the right time. "If you catch it just before the collision, they're just two ordinary-looking clusters," he told BBC News. "All the gas and galaxies and dark matter are attracted to each other under their own gravity, so over a very long period of time, they'll fall back together again and end up one big cluster, where everything is in one place. You have to catch it at just the right time, just after the impact where everything is temporarily separated out." The Pandora cluster - known officially as Abell 2744 - has been spotted by astronomers at just such a moment; the galaxies and vast amounts of hot gas have splayed out in all directions. Until recently, Abell 2744 existed as just another galaxy cluster in a catalogue, one among thousands. But Dr Massey said that what made it stand out was data from the Chandra space telescope - X-rays emitted by the clusters' phenomenally hot gas. The team, comprising Dr Massey and 17 researchers from around the world, then secured time on the Hubble space telescope to get a closer look. Hubble's sharp view allowed the team to map out the dark matter in the cluster through the effect of gravitational lensing - a phenomenon in which the heavy-but-invisible matter can bend light passing by it, creating multiple images of stars and galaxies behind it. "Now we've got a combined picture of the galaxies, the gas and the dark matter, and we can put together the full picture with all three ingredients." That full picture is an extraordinarily rare collision - and a rare opportunity to learn more about dark matter. It remains enigmatic not least because it interacts very little - if at all - with normal matter, so the dark matter of the Pandora cluster has careered through the crash scene, emerging on the other side. The galaxies and hot gas have lagged behind somewhat, and Dr Massey said that leaves huge swathes of dark matter exposed to further study. "All the galaxies and gas do lots of complicated things and they just sort of confuse us if they're happening in the same place as the dark matter," he said. "When the dark matter is on its own we can step back and study it while it's not obscured by everything else, sat there doing its own thing - and we can figure out what that thing is."